I recently purchased a Virtual Boy from ebay. I did this not because I’d had a virtual boy when I was a child, or because I’d always wanted one, but because I found out there are not one, but TWO versions of Tetris for the system, one of which is completely in 3D. Well, actually, since they are for the virtual boy, they are both viewed in 3D, but the game titled 3D Tetris consists of actual 3D pieces in a 3D playing field. (I scoured the internet to find this screenshot, so you’d better appreciate it.) 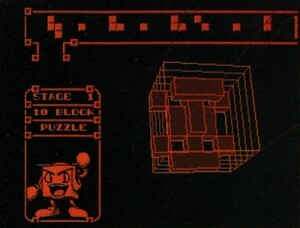 The Virtual Boy version of 3D Tetris is just okay. I think the controls are pretty good, but there isn’t much depth to the gameplay, and I hate to say it, I really wish there were some way to save my game. You do get to pick a level to start from, and choose a difficulty. If you start on easy, the game is really easy. It mostly just gives you pieces that are made up of 3 or less squares. 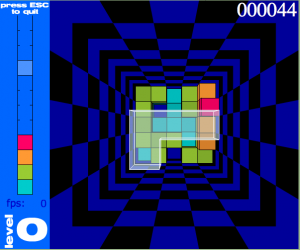 This wasn’t the first time I’d played a version of 3D tetris, however. 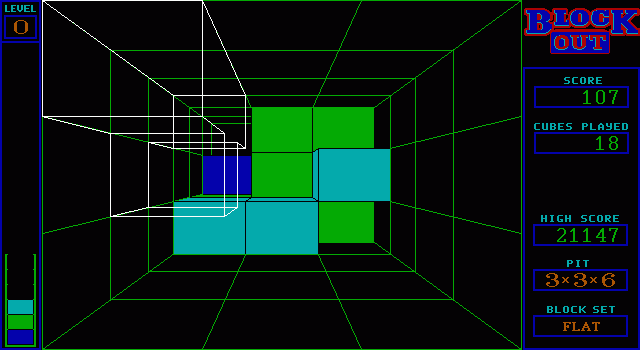 In fact, not more than a few years ago (possibly as many as 5), there was a time when I was SERIOUSLY addicted to 3DTRIS which is a flash implementation of this type of 3D Tetris, playable in your web browser. I think this relatively simple flash implementation gets a lot of things right. It may have been one of the first high score lists I’d ever seen that keeps track of scores for “the last 24 hours” and “the last 30 days” in separate lists. But I don’t think even the flash game was the first place I’d played 3D Tetris. Way back in high school, I remember distinctly discovering a version of 3D Tetris called Welltris. I’m not sure if I even understood it enough to play it. Looking at the screenshots now, I’m still not sure I know what’s going on exactly. I also didn’t know if Welltris was the first version of 3D Tetris ever made, so I did some google searching, and it looks like both Welltris (pictured above and including game’s designer, Alexey Pajitnov who was also the developer of Tetris), and another game called Blockout (pictured below, and obviously a more direct ancestor of all these modern 3D Tetris variants) were both released in 1989. I have no idea which was first, and it was probably close enough that it doesn’t matter. Enter today, when I reluctantly purchased Polycubes on my iPhone for ninety-nine cents. I say reluctantly, because it’s hard for me to justify purchasing games that are obvious clones of games I could be playing in flash… for free. The flash games were obviously first, (although just as obviously still clones) and I have this inclination to distrust developers that just make clones of already-existing games. (Flash games are somehow different because they’re free to play. I see it as sort of the democratization of video games.) Anyway, there are so many game possibilities out there, why make a game that already exists? (There are actually tons of reasons to do so financially, but that’s a topic best left for another post.) Anyway, let it suffice to say that curiosity overcame my disinclination, and within minutes, I had absolutely no regrets. Polycubes is pretty no-frill at this point. I’m really hoping the developer decides to add some more features. I’d give at least my pinky toe to see the piece coming up, for instance. I’d also like a way to access the high scores, and I’d give out huge bonus points if there were any sort of online high score tracking. Right now I think it’s supposed to tell you if there is a higher or lower score already played with the same game configuration, but even that doesn’t appear to be working for me. (Either that, or the fact that the game doesn’t remember your previous game settings is making it impossible for me to play the same configuration more than once.) This leads nicely into the main reason why I’m particularly impressed with this implementation. I guess at least some versions of Blockout also have this ability, but on the configuration screen (the only other screen other than the game itself) you can choose the size of the gameplay area, the starting level, and also choose from three different types of pieces to play with, simple, medium, or complex. That leads to a whole heck of a lot of gameplay possibilities. Dialing the playing field up to 16×16 is almost unplayable, but totally fun at the same time. I’m clearly a geek for this sort of stuff, but I have no regrets about picking up Polycube, and neither should you. Not to mention, hey, it’s A LOT cheaper than buying a Virtual Boy on ebay! 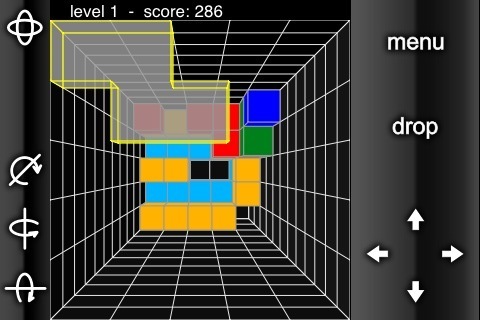 This entry was posted in Reviews, Tetris by Martin. Bookmark the permalink.